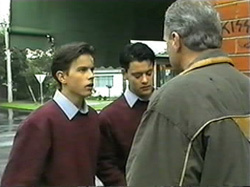 Jim tells Todd and Josh off - they should leave it to the police to sort things out. Jim spots that Josh is wearing one of Paul's runners and he's not happy. He says they'll discuss things further at home. Melissa sitting at a table and a guy called Turner comes up and has a go at her about English class. Cody comes up and tells him to rack off. Melissa says she used to get good marks before they got the new teacher. Cody suggests that they do some revision tonight. 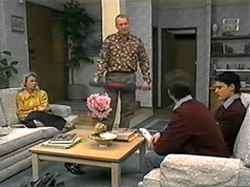 Helen tells Pam and Doug that a tradesman turned up to do a job at their house - Jim was not happy having to pay a call- out charge for a job he could have done himself. Pam explains that they've had the same experience - Joe arrived to cut their trees. Now Doug has had to pay Joe $50. Madge has also had a visit. Pam thinks that someone should have "a word" with Dorothy and looks pointedly at Helen. Helen is not impressed, but Pam says Helen is the only one Dorothy will listen to! Ryan and Dorothy are doing a post- mortem on today's history exam. Ryan thinks he went OK, but he doesn't think the essay question was very good. Dorothy says he studied a lot so should be OK. He should just move on to the next subject. Dorothy says he can make a start on his maths, and she wants to take him out for dinner at Lassiter's later to relax. Ryan thanks her and says he wishes everyone in Ramsay Street could see her like he does. He suggests she loosens up a bit. Jim is berating Todd and Josh about their plan. Helen says the boys might have a point, but shouldn't go looking for trouble. Todd says that all he wants is his runners back. Jim says they'll have to replace Paul's runners - they cost $300! Todd tries to protest, but Jim says he'd better consider himself lucky it wasn't worse! Cody is helping Melissa with her English, but she isn't doing too well with it. They are both getting frustrated. Josh comes around to find Melissa and tells them about losing Paul's designer runners. Josh wants to know why Melissa didn't meet her at Todd's place this afternoon. They talk about Justin Freedman and how they were caught drinking alcohol. Apparently he's having another party and has invited Melissa to come. Melissa says she's not going, but clearly she's feeling under pressure. Dorothy and Ryan are just heading off to Lassiter's when Helen pops around. She asks Dorothy if she's booked tradesmen for the street and Dorothy says that she has. Helen says that Dorothy is being presumptuous, but Dorothy reckons that she was just doing them a favour! Helen says the neighbours don't see it that way and it's been suggested that Dorothy pays for the work she authorised. Dorothy is unrepentant and says she'll just resign from Neighbourhood Watch. Helen will just have to take the position back. Jim is at his drawing board. Helen tells him that no- one is prepared to take over as Neighbourhood Watch coordinator. Helen wants Jim to do it and he looks horrified. He finally agrees, however. They talk about Todd and Helen says he took his cricket bat with him again today. Todd and Josh sit down with Melissa. Josh hassles her about English class again, and then tells her he'll meet her at Cody's after school before walking out. Todd sits down with Melissa and realises she doesn't look too good. She says she's just tired. 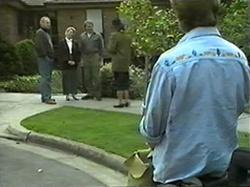 Dorothy and Ryan arrive home to find Jim, Helen and Doug standing on the pavement outside her house. Dorothy starts a conversation about who is going to take over the Neighbourhood Watch programme. They all gang up on Jim and tell him he'll have to do it. Dorothy is going out with John tonight. She tells Ryan she's a bit nervous about it, she thinks John is getting too serious. She asks Ryan to help her out by taking the rest of the Neighbourhood Watch stuff over to the Robinsons. As Ryan is leaving, John arrives. He suggests going for a drive and going to a restaurant by a river. He notices she seems out of sorts and asks her what's wrong. Doug is canoodling with Pam while Josh and Cody try not to vomit. Josh and Cody have both been stood up by Melissa this afternoon and wonder where she is. Doug tells Pam that Jim is the new Neighbourhood Watch coordinator and she laughs. Jim is despairing at the amount of Neighbourhood Watch stuff that Dorothy has sent over. Ryan tells Jim that there's another side to Dorothy - she doesn't always realise how bossy she's being. John is telling Dorothy that people don't appreciate her. They chat about how wary they were about the Introductions Agency. 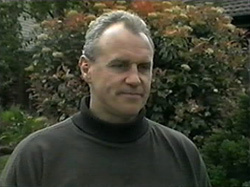 John tells Dorothy that she's opened a new chapter in his life and he hopes it'll be a very long one. Dorothy just drinks her sherry! Cody tells Josh to just call Melissa, but just then, Melissa comes to the door. She doesn't look very well and sways, asking Pam to get her a glass of water. Josh rants at her for constantly standing him up and asks if she's been drinking. She says she hasn't, but no- one really believes her.